I can't say I grew up eating "ethnic food," but I have very strong memories about pierogies. I was raised in upstate New York, but sometime holidays we would find ourselves in West Virginia at my grandparent's house. They were my Mom's side and very much Polish and Lithuanian. I remember down in the basement, on my grandpa's work bench, my grandma, mom, and her sister would make dozens and dozens of pierogies. The work bench was the only place that had enough room to roll and fill them all, especially since the kitchen was full of other tasks, like frying kielbasa and making poppy seed roll and pizzelles. It always seemed very "old world" to me, down in the dark basement, surrounded by my grandpa's welding equipment, rolling out dough and plopping down potato or cheese and dill fillings. 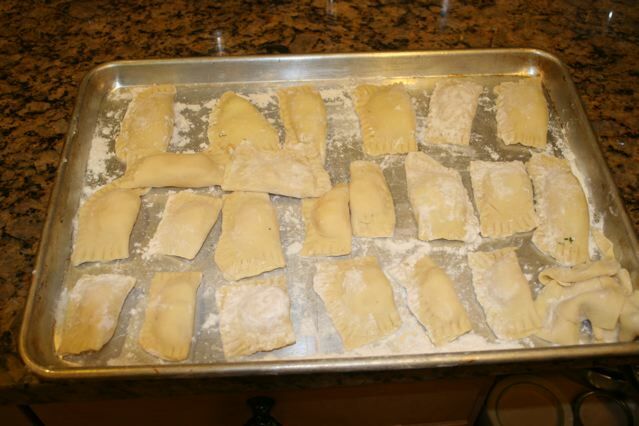 Not that I was doing any of the pierogi assembling, as I was a child. But now, my mom has been showing me how to make them on my own, although I've only done it once solo. And those were way too thick and doughy. So for New Years, I wanted pierogies. My mom made the dough, showed me how to roll it out thin, and put in a proper amount of filling. And then we browned three sticks of butter as a sauce. 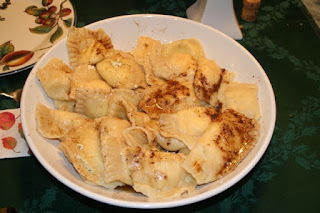 In Northeast PA I once had terrible, dull, but properly-made pierogies. I couldn't believe they didn't brown the butter, they just melted it and poured it over. But it was at a church bazaar, and they last thing I wanted to do was argue with an old church lady about the proper way to make pierogi. I think you need the brown butter to give the pierogies that savory depth that makes them rise above just mild noodles stuffed with potatoes or cheese. To not have that brown butter made them taste flat and dull. Now in 2012, although we were in my Mom's brightly lit kitchen, not in a WWII-era brick house in the hills of Appalachia ,rolling out the dough and sealing the stuffing in with eggwash and fork tines still felt like a tradition. Which is different from just making comfort foods. As my sister-in-law Youngjoo told my mom, "Noodle making is a family activity." Sure! Let me type it up this weekend - my Mom's recipe is in a binder, but I've wanted to type it up anyway. Below is my mom's recipe. It's a great recipe, but I'd like to emphasize the use of browned butter as a topping. I've had pierogies made by old Polish women at a church bazaar, but they just used melted butter, making the pierogies taste bland and flabby. The browned butter gives the pierogies more depth and savory richness. Hope you enjoy! Do about 3 hours before making dough. Peel and boil enough red potatoes to make three cups mashed potatoes, adding a clove or two of garlic to salted cooking water. When potatoes are tender, drain and mash. Add ½ cup of extra sharp cheddar cheese. Stir to melt cheese. Make sure potato filling is cool before placing on dough. Mix all ingredients except flour together. Mound the flour on the counter in a heap, making a small depression in the center. Slowly pour the liquid mixture to make a soft dough. Knead until smooth and let rest 20 minutes. Divide the dough into two equal parts. Roll one batch of dough on floured counter until very thin. 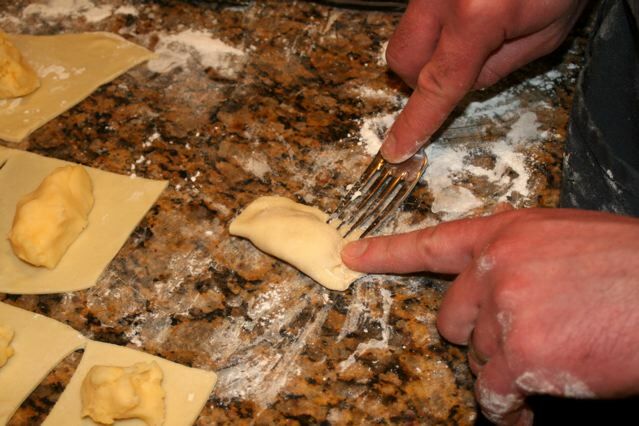 Cut dough into two-inch squares. Place a teaspoon of filling on each square. Using cold water, moisten one side of the dough, just on the edge. 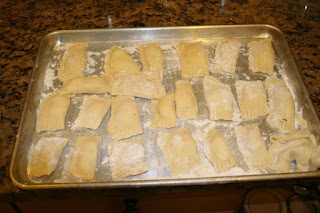 Fold the dough over and press the wet and dry edges together to seal. Seal with the floured tines of a fork. Continue, the repeat with the second batch of dough. (We might use one batch for potato filling, another for cheese). Place on a floured cookie sheet until ready to boil. Cook 12 at a time in 4 quarts boiling salted water. You can do more in a larger pot, just don’t let them touch. When they rise to the surface, turn them over and cook 5 minutes more. Taste one to check dough is fully cooked. If still firm, allow another minute or two of cooking time. Drain. Serve with butter that has been cooked until it turns a dark brown color and has a nutty aroma. Use about 1.5 sticks of butter – and never margarine. Serve and enjoy.